Welcome to our first Blog post. We hope to do some fun spotlights of guests and staff, behind the scene stories and include interesting thing to do when you visit the beach. If you have ideas of what you would like to see featured send us a note to heatherh@cwcresort.com. At first glimpse, Eric Simpson is an adventurous and fun guy who enjoys his Keno and has a keen wit and sharp sense of humor. As you start listening to him, you discover that his joy of playing Keno is genuine. At Chinook Winds Casino Resort we encounter so many interesting people as they come and go, but some leave a lasting impression. Eric is a guest who leaves a positive mark on staff and guests every time he is here. Eric was born in England and moved to the states shortly after his birth. They lived in Florida and then in Canada for about three years before making their permanent home in Salem, Oregon in 1973. Since then Eric has grown up enjoying his garden. He started growing Sweetpeas because “that was the flower my mother is holding in her wedding picture”, and soon expanded to tomatoes and a few other garden variety (pun intended) vegetables. His passion for his garden is evident in how he lights up when talking about it. “I like to give some of my plants to local elementary schools to inspire our youth to get excited about organic gardens”, said Eric. How does he win so many times? For years Eric has visited our Resort and played his favorite 6 or 8 spot progressive Keno game. He might enjoy a random Keno Game King machine, but his favorite is good old fashioned Keno. “I enjoy visiting with the friendly staff here. For years I would bring my companion (his beautiful dog) Freddie and enjoy the beach and play a little”. In August 2017 Freddie passed away, and since then Eric has come back numerous times walking the beach where he and Freddie walked. When asked how he chooses his numbers his answer was simple, “I will try many combinations, but mostly I pay attention to the staff and use special dates such as Freddie’s dog tag number and numbers I have used with my dad until he passed away in 1997”. Many would say Eric is one of the luckiest Keno players we have here at the Resort. Since July of 2017 Eric has won a Keno Progressive seven times. You read that correctly, seven times a Keno Progressive winner! As we talked, Eric was very humble and simple about how he chooses his numbers, but he was methodical in his approach as well. He doesn’t do anything by chance, in fact he has solid plans of play every time. He will sometimes visit Reno and if numbers worked at Keno in Reno then he will try them here. If numbers are in a slump he will take a look at everything he has tried and go back to numbers that used to work and give them a try. When asked what his secret is, he looks you square in the eyes and says, “I’m a time traveler. Your present is my past. I cannon expand on this due to the rupture of the space-time continuum”. 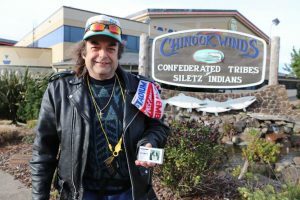 Eric isn’t just a dedicated Keno player to us here at Chinook Winds, he has become a guest who is part of the family and is happily referred to as the “salsa king”. He grows tomatoes at his home in Salem and graciously makes salsa for his friends – which includes many here at Chinook Winds. Last year Eric made more than 20 gallons of salsa for his neighbors, friends and a number of folks at Chinook Winds. When asked why he visits us, his answer was simple – “You have the nicest people here”. Thank you Eric, for visiting us and choosing us as your place to relax, have some fun, win a little, but as you said, “leave the place better than when you came and do a good deed every day”. 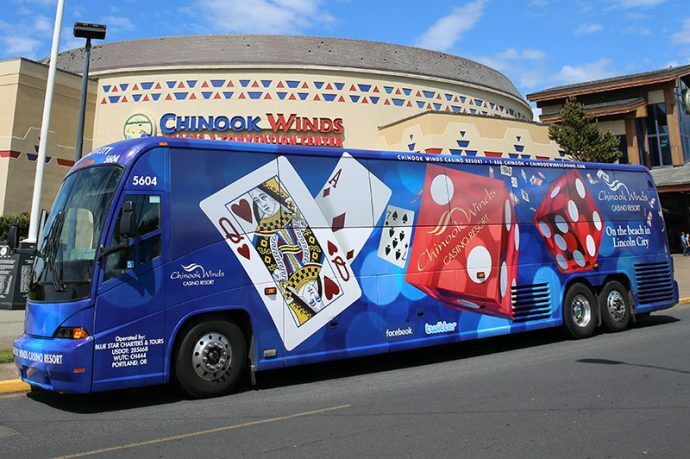 This is the first of many Blog posts to come for Chinook Winds Casino Resort. We hope you enjoy our conversations with our guests, information about the area and fun topics of interest. If you have ideas on topics feel free to email heatherh@cwcresort.com and make sure to subscribe to our posts so you don’t miss out on any information.